brightening the holiday season in Pueblo for 29 years! took place on Saturday after Thanksgiving. It's time to start planning your 2019 float! our sponsors and our wonderful volunteers. 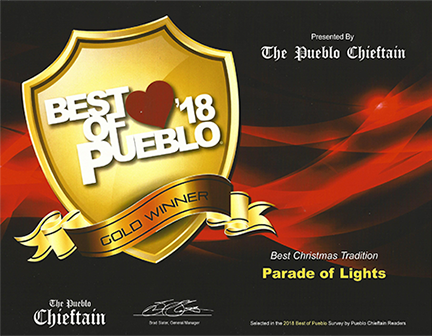 ​2018 Pueblo Parade of Lights, see PuebloParadeOfLights.com. ​the Pueblo Parade of Lights possible! ​2017 Pueblo Parade of Lights. joining the parade line-up, your float in the parade. Please send them to puebloparadeoflights@gmail.com. Put "parade photos" in your subject line. Please include your name and address so we can send you a token of our thanks. Pueblo Parade of Lights website.